WELCOME to Open Journal Systems (OJS) Jurnal Peternakan Indonesia (JPI) "Indonesian Journal of Animal Science". 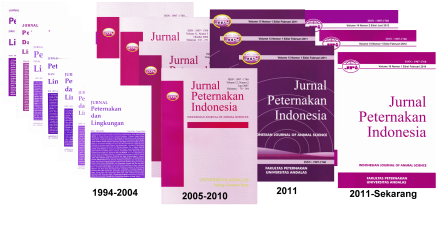 Jurnal Peternakan Indonesia (JPI) published by Faculty of Animal Science Universitas Andalas, as a media publication of research results, assessment and deepening of literature on science and technology in the field of animal husbandry and veterinary. JPI is published to refine and continue the Livestock and Environmental Journal (JPL) that has existed since October 1994. JPI is published three times a year in February, June, and October. Accepted/received scientific papers have not been published or are being considered for publication in other journals. More information about this Journal is available on Journal history. Note: Any article submissions through the website, please kindly confirmed via email. Manuscript templates can be downloaded here. Authors Guidelines can be downloaded here. Author Stetement Form can be downloaded here. Template Artikel JPI can be downloaded here. At least had the title of doctor. In the last 3 years at least once wrote an article (correspondent author) or at least 3 articles (as a co-authors) on the periodical scientific Journal.